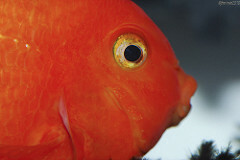 While the Blood Parrot fish may have acquired a bad reputation for being aggressive. The simple answer is they are only a semi-aggressive fish. Compared to most aggressive fish they should be considered peaceful in most respects. And most of the aggression they do exhibit is territorial and usually never leads to injury or death. For a complete understanding of the Blood Parrot, it’s a good thing to know about the species first. 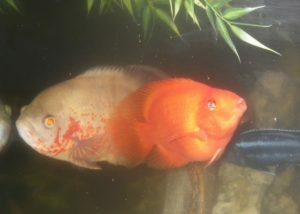 Blood Parrots are not a fish found in nature, they are a man-made hybrid created exclusively for the aquarium trade. 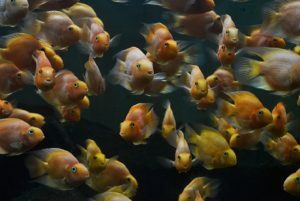 It’s believed that they are a result of a cross of the Midas cichlid and the Redhead cichlid. Due to their hybrid nature and poor breeding practices, they have a wide range of deformities. One of the more pronounced deformities is their mouth, their mouth is usually so deformed it is unable to close. Another unfortunate side effect of their breeding is they have a deformed swim bladder. Because of this they have an awkward swimming pattern and are not as maneuverable as other fish. Along with the deformed swim bladder, they have a curved and compressed spine, which causes them to have a severely arched back. 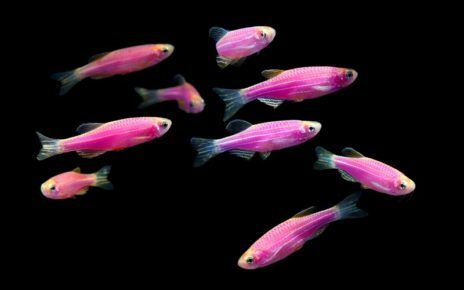 These fish still live happy healthy lives, with some blood parrots recorded to live up to 15 years. The deformities do play a role in their everyday life, and they will limit how dangerous and aggressive they can be. 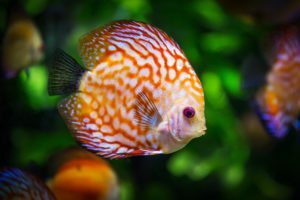 The aforementioned deformities put a limit on the Blood Parrot’s ability to fight and or do any serious harm to other fish. 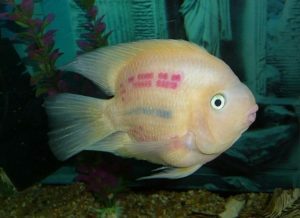 The most important deformity that makes a Blood Parrot much less dangerous than other aggressive fish, is their mouth. 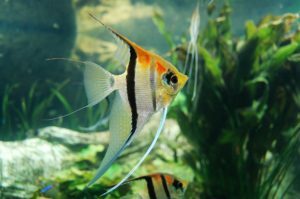 Since they are unable to close their mouth, they really can’t cause any damage with their bite, unlike most other aggressive fish. All they really are able to do is push around other fish with their lips. The other deformity which limits the danger they pose to other fish is their deformed swim bladder. Since their swim bladder is so enlarged and imbalanced, they really can’t outmaneuver other fish. They still can fight with each other since they all are on the same level in that respect. But for the most part, their fights just tend to be awkward pushing matches. 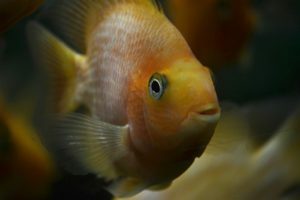 For all of these reasons the level of aggression a Blood Parrot may exhibit, is almost completely nullified by their long list of deformities. 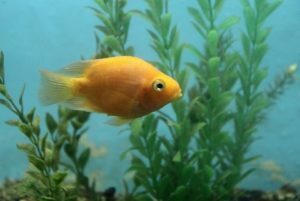 And while it may still be possible for a Blood Parrot Fish to cause problems in a tank. The likelihood of one causing a severe injury to another fish of equal size is almost completely nullified. 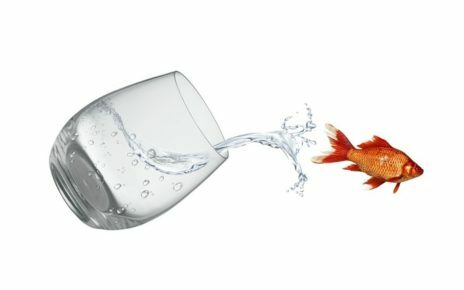 While the Blood Parrot can be aggressive at times, it’s important to understand their whole range of behaviors before stereotyping them as an aggressive fish. 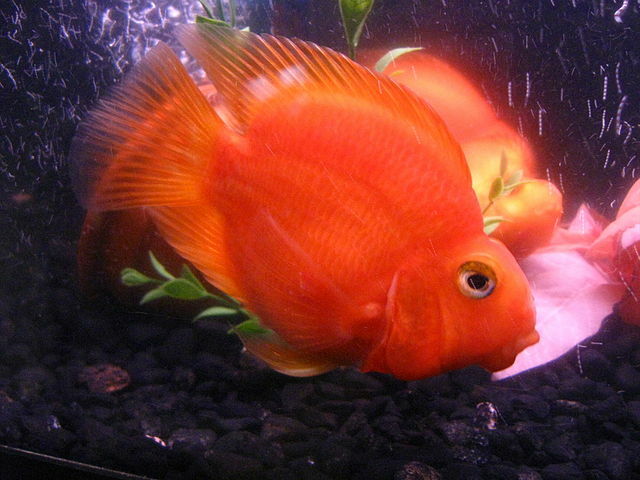 In most cases, Blood Parrot fish rarely ever show aggression and are actually very calm and peaceful fish. In no way are they constantly looking for a fight, and will actually get along quite well with fish of equal temperament. 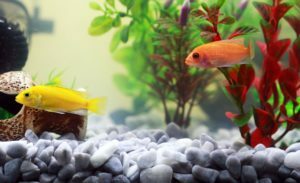 A real risk would be thinking they are aggressive and keeping them in a tank with other really aggressive fish. If a parrot fish is kept with other aggressive fish, they most likely would come out on the losing side of any fight. Since they can’t swim very well, most other aggressive fish will easily outmaneuver them. And with their deformed mouths, they can’t even bite back to defend themselves. So while Blood Parrots may have aggressive tendencies. They should actually be kept with equal sized peaceful or semi-aggressive fish and never with truly aggressive fish. For the most part Blood Parrot fish are actually very smart and people friendly fish. They have very good eyesight. And they will seem to be more focused on whats going on in our world than whats going on inside the tank. Some Blood Parrot Fish are even able to tell the difference between individual people, and they often understand who feeds them. Besides their interest in the outside world, they do seem to have a social order inside the tank. And this might be one of the reasons why they tend to get into fights. If you ever see two parrot fish kissing or fighting, this is most likely a display of territorial dominance. In most cases, Parrot Fish have a clearly defined pecking order, but if this is challenged a fight may ensue. These fights rarely ever lead to any harm, but they should be monitored in case a larger Parrot fish takes their bullying too far. 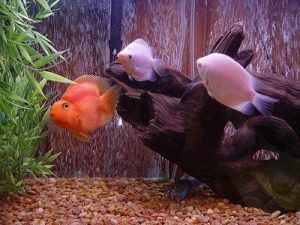 For the most part, inter-species Blood Parrot fights follow the same pattern where the parrot fish start chasing each other, and then start kissing and then they eventually give up. 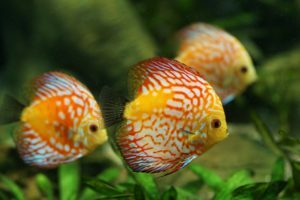 If there happens to be a very large disparity in size between two Blood Parrot fish, then isolating the two fish for the smaller one’s safety may be necessary. While interspecies parrot fish fights are rarely a problem. A Parrot Fish attacking a fish of another species, especially a smaller one could lead to the parrot fish killing the other fish. 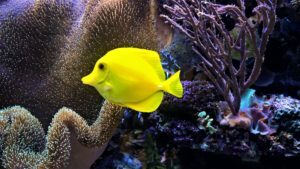 And while they won’t be able to bite, they can push the other fish into rocks or other ornaments and cause a smaller fish harm. And like all other fish if they can fit it in their mouth they will eat it. So if a Parrot Fish is put in a tank with smaller fish, they will eat them. This should not be considered aggression, it is simply feeding behavior. 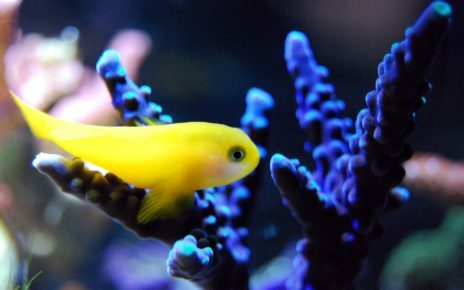 Because of this very small fish should never be housed in the same tank as a Blood Parrot.